Snowboarders have a slightly higher risk of injury than skiers, a new study has found, highlighting the importance of taking out adequate sports travel insurance before hitting the slopes. The research from the University of Vermont College of Medicine in Burlington also revealed that young and inexperienced female snowboarders are most likely to get injured. 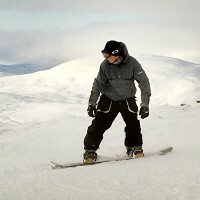 A hurt wrist or shoulder are the most common injuries to snowboarders, while skiers are most commonly affected by a knee ligament. The university's Dr Robert Johnson and colleagues examined medical reports from the Sugarbush Resort in Vermont from 1988 to 2006. During those 18 seasons, they found that around 12,000 skiers and snowboarders injured themselves severely enough to require treatment at the resort's clinic. The total number of visitors at the resort was 4.6 million. Commenting on the study, Dr David Salonen, a radiologist who has studied ski injuries at Toronto Western Hospital, said: "It's true, these things do happen." But he added: "For how many people are out there skiing (and snowboarding), injuries are relatively rare."